This Canadian recipe was submitted by a reader. 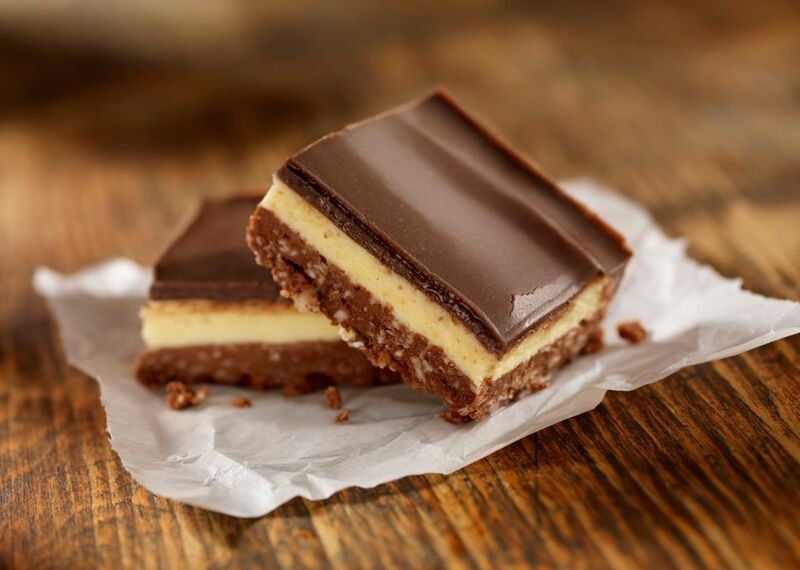 The popular Nanaimo bars are with vanilla pudding and chocolate, as shared on our forum. The bars are not baked, but if you prefer a firmer baked crust, see the instructions below the recipe. The bars are named after the British Columbia city of Nanaimo. Bottom Layer Melt sugar, butter and cocoa in a double boiler. Whisk in the egg and vanilla. Remove from the heat to cool. Add graham cracker crumbs, nuts and coconut and mix well. Cover the bottom of a 9-inch square pan with the mixture, packing it down well. Refrigerate. Second Layer Cream the butter and pudding mix. Add milk and powdered sugar and beat until smooth. Spread over first layer and chill until firm. Third Layer Heat to melt. If too thick, add milk. Pour chocolate over top of second layer. If you prefer a baked crust, melt the 1 stick of butter; add the sugar, cocoa, egg, vanilla, graham cracker crumbs, pecans, and coconut. Blend well and pat into the pan. BAke in a preheated 350 F oven for 10 minutes. Let cool and proceed with the second layer.